Fethiye is one of the best known tourist destinations in Turkey, attracting thousands of visitors during its peak summer season every year, whether they come by luxury yacht as part of a Blue Cruise, or by air flying into Dalaman Airport. 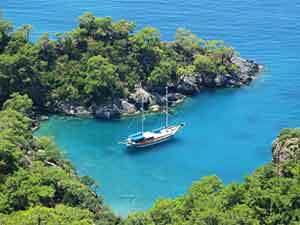 There are many reasons why Fethiye is so popular. 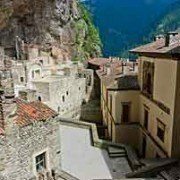 It’s an ancient city for one, and there are still ruins from ancient times to be seen around the city, as well as the famous rock tombs, carved into the mountainsides. The scenery is spectacular here and includes a long, sweeping bay that is naturally protected by a peninsula, but this is just the start! 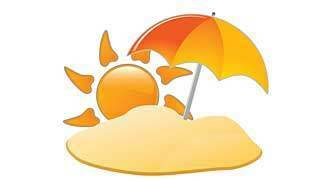 The climate, hospitality, beaches, shops, markets, and restaurants all add to the appeal. Fethiye’s Marina, on the western edge of the town, is of an excellent standard and has a berthing capacity of 400, up to 60 metres in length. 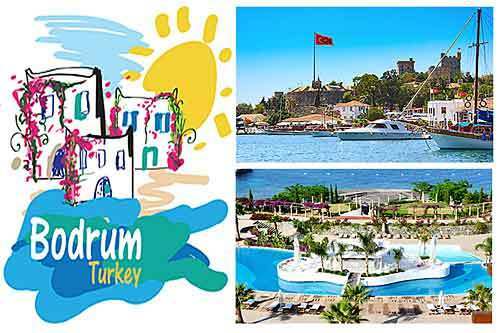 From here a local taxi or dolmus (minibus) can take you right into the heart of Fethiye if you’re mooring your yacht for the night and want to explore. An alternative is to enjoy one of the town’s luxurious 5 star hotels or resorts. 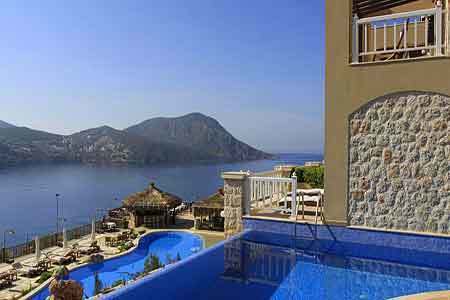 There are three of a 5 star rating – the Hillside Beach Club, – Club and Hotel Letoonia, and Jiva Beach resort, along with a number of attractive 4 star hotels too. Fethiye is best known for its amazing rock tombs. 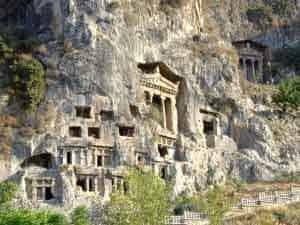 Carved into the mountainside above the town, these rock tombs were built by the Lycian people as resting places for their highest revered people. There were carved into the rock around 2,500 years ago and these elevated positions were chosen so that mythical winged creatures could more easily carry the souls of the dead away to their next lives. There are numerous rock tombs to see rising above Fethiye, with the best known and largest being the Tomb of Amyntas. More like a temple than a small tomb (as most of them are) this one is really special. There are other ancient landmarks to see around the town too, if you’re looking for a fix of ancient history here. 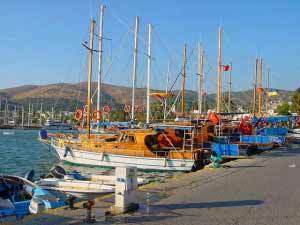 Landmarks include Fethiye Amphitheatre, which is right by the harbour. Though it was probably built by the early Roman Empire it’s believed there was a theatre here dating back to the times of Alexander the Great. If you came to Fethiye by luxury yacht you’ll be able to see much of this beautiful coastline when you arrive and depart, but there are also other ways to see the best scenery. 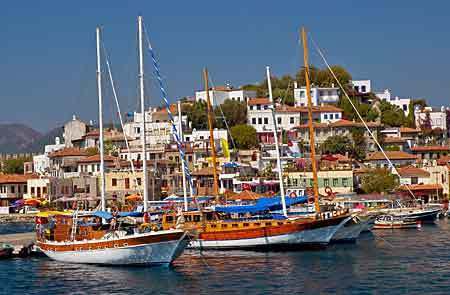 From Fethiye harbour there are always a number of boat cruises ready to take you a full day or half day cruise though the most popular is the 12 Island Boat Trip. This trip takes most of a day and includes lunch. It takes in the scenery as well as making a number of stops for swimming and snorkeling. It’s a fun day trip for the whole family. 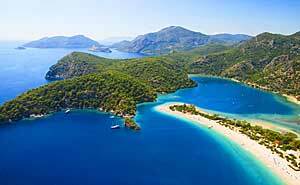 If you are staying in Fethiye for a few days make sure you also visit some of the nearby attractions that include the breathtaking scenery of Oludeniz and its Blue Lagoon, as well as Saklikent Gorge, and Butterfly Valley.